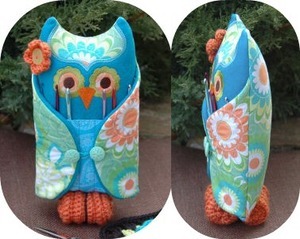 Our unique Owl Crochet Hook Holder holds your crochet hooks. How adorable is this!. . . and it's made 'in the hoop'. The 3D wings open to store stitch markers, yarn needles, etc. The wings close to keep everything secure. Instructions are included for her 'feet' & flower. Both are simple crochet. Here's a few close ups to check out the quality of the stitching.